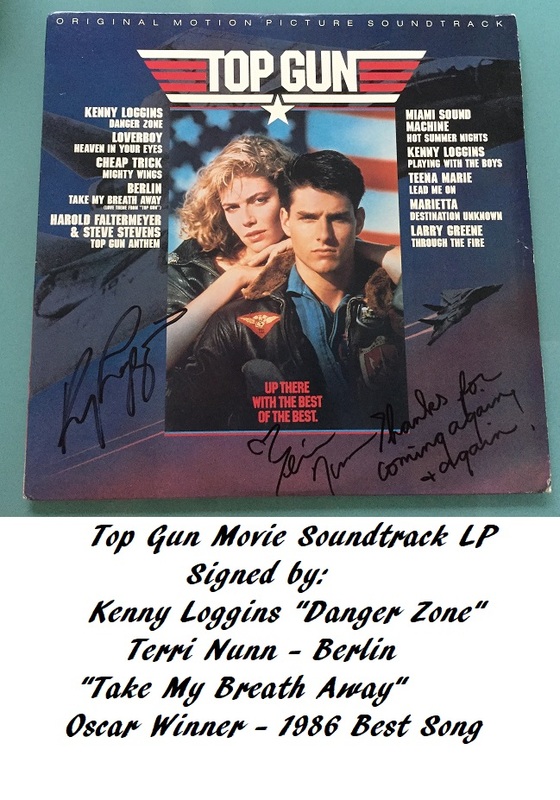 A stunning, authentic, signed, 12" Top Gun Soundtrack LP, with original vinyl, for the blockbuster movie. The song "Take My Breath Away" won an Oscar for Best Song in 1986. From the beginning of the movie, Kenny Loggins takes the music score to dizzy heights, with "Highway To the Danger Zone " ! Not seen another signed LP like this with both the main vocal artists. See our other rare Top Gun items, using the 'Quick Find' search bar. Terri Nunn (Berlin) - Adds "Thanks for coming again" to a fan. Obtained from in person collector , Seattle , USA.